In this article we want to outline the necessary steps to process the Commercial Endorsement of a RYA degree what would be to move from a recreational title to a professional. The Medical Certificate must be recognized by the RYA/ MCA. There is one in English, ENG1. For Spaniards it is best , once the Basic Traning is completed and the Maritime Booklet is processed, to do the Medical checkup of the ISM (Social Marine Institute), which is recognized by all countries that signed the Agreement STCW95. The PPR is an online course that is done from home through a recognized RYA center. Once you have all the necessary certificates, you must complete the “Appliction for Commercial Endorsement”, and send it to RYA. As you will see, by not working in the UK territorial wa ters, we have to present the 4 STCW modules. 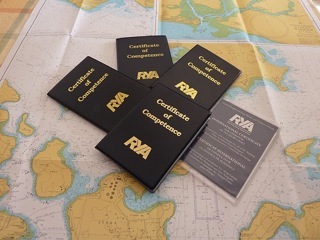 If you already have all the certificates before processing the Yachtmaster Title, you can send everything together (usually done by the examiner once passed the exam), and in this way the RYA sends the certificate with the Commercial Endorsement. But usually, what to do, is first to process the title of Yachtmaster, and once all necessary certificates have been obtained, the Application Form is filled and the Commercial Endorsement is processed. Yacht Point is the only school in Barcelona approved by the RYA and the Generalitat de Catalunya.